The Wonderful World of Louis Armstrong: Another Birth Announcement: Finished Books Are In! Another Birth Announcement: Finished Books Are In! Before I get started, thanks to my loyal readers who wrote in publicly or privately to wish me and my wife Margaret best wishes on the birth of our second daughter, Melody Patricia Riccardi. After four days in the hospital, we came last night for the first time to juggle the phenomenon known as two children. So far, so good. Margaret's coming along well after her second C-section surgery and our two-year-old daughter Ella stole the show when she saw Melody for the first time, smiled and said, "She's kooky!" But I had another important announcement to make that day that I decided to shelve because I didn't want to take the spotlight away from my beautiful, growing family. As most of you probably know, my book, "What a Wonderful World: The Magic of Louis Armstrong's Later Years," after a few delays, had finally been given a definite publication date of June 21. Well, what was my wife's official due date for this baby? You guessed it, June 21. 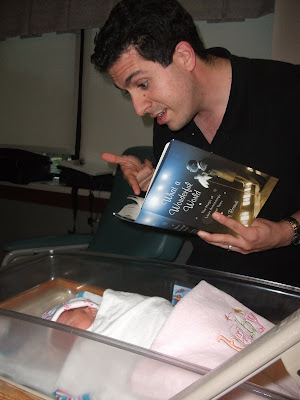 I knew that neither of these things happen on time so I always joked to friends, could you imagine the book and the baby arriving on the same day? Well, that's pretty much exactly what happened! On Memorial Day weekend, I received an e-mail from my publicist saying the finished books were in and I could pick mine up on Tuesday. I went to bed Monday night excited about the chance to finally hold it in my hands...until 1:29 Tuesday morning when Margaret woke me up to say, "It's time!" Flash forward 24 hours and we had a new beautiful baby daughter, we spread the news to friends and family from around the world and we greeted happy visitors at the hospital. But at the same time, I knew my book was sitting there at Random House's office on Broadway in New York. For the newxt few years, shouldn't it be Papa Diap? Congratulations all around, especially to Margaret! Now you can start teaching everyone the words to MY BRAZILIAN BEAUTY . . . ! All of my best wishes to your wife and ALL of your childrens. I think you are in heaven, eh? Louis Armstrong. One in a million. Good to see this blog...because more people should know what an impact he has made on music. Hilarious pics. What a wonderful family. Congatulations! Nice pics! Gonratulations and good luck! Life is beautiful, eh?